I am a 31-year old woman from Langbinsi. I was born and brought up in a Christian home with a relatively small family. I am second of five children. I did my elementary education – both primary and junior high school - in Langbinsi Roman Catholic (RC) education unit and completed in 1997. I attended Bolga Girls Senior High from 1998 to 2000. After completing high school I was fortunate to be employed by PAMBE Ghana as a classroom teacher in 2009. 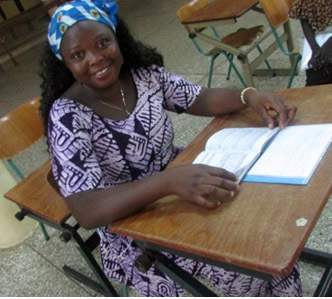 Three years later, PAMBE Ghana sponsored me and two other colleague teachers to do diploma in basic education (DBE) at the university of Cape Coast by distance learning. I successful completed the course and now hold a DBE diploma. I love teaching children. When I was in junior high school I started teaching Sunday school and enjoyed it. I am married and have two beautiful daughters, Lovina and Lordina. We live together with my husband in Langbinsi.